Antigua and Barbuda is a small island country that consists of two major islands and a number of smaller islands. It is located between the Atlantic Ocean and the Caribbean Sea. Christopher Columbus was the first to sight the islands in 1493. They were colonized by the English in 1632. In 1672, the islands of Barbuda and Antigua became part of the colony known as the Leeward Islands. In 1816, the colony was divided in two (with Montserrat, Barbuda, and Antigua as one colony), but it was eventually reformed in 1833 and existed until 1958. After the Second World War, the colonial system began to decline. In 1958, Antigua and Barbuda joined the West Indies Federation. The short-lived federation collapsed in 1962. Antigua and Barbuda became a separate colony. In 1967, the islands became a state in free association with the UK. 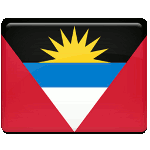 On November 1, 1981, Antigua and Barbuda became a fully independent state within the Commonwealth of Nations. The anniversary of independence is now celebrated as a national holiday. It is marked with various festive events.